Halley's Comet passed perihelion in its first known passage, as determined from records by Chinese astronomers. Johannes Kepler confirmed his Third Law of Planetary Motion, which he'd rejected on March 8 after initial calculations: The squares of the sidereal periods of the planets are proportional to the cubes of their semi-major axes (p**2 = a**3). Francis Baily observed "Baily's beads" during an annular solar eclipse and wrote a widely disseminated explanation of the phenomenon. In a field outside Grass Valley, California, Lyman Gilmore reportedly became the first person to fly a powered airplane (a steam-powered glider). The US Post Office Department began the first regular airmail service in the world, between New York City, Philadelphia and Washington, DC. Aboard a Boeing tri-motor, Ellen Church became the first airline stewardess, on a Boeing Air Transport flight from Oakland, California to Chicago, Illinois via Cheyenne, Wyoming. C. Jackson discovered asteroid #1506 Xosa. The Goddard Series P Section B rocket test series was started using a new gas generator, with eight static tests at the desert launching tower, through 4 August 1939. The average interval between tests was 7 days. The first powered flight of the USSR BI-1 rocketplane reached a maximum speed of 400 kph, a maximum altitude of 840 meters, and had a flight time of 189 seconds. The US Naval Research Lab V-2 Solar mission, carrying cosmic and solar radiation, temperature, ionosphere, and photo experiments, reached an altitude of 135.5 km, and landed east of the impact zone, on the outskirts of Alamagordo, New Mexico. NACA X-1E Flight 15, piloted by Joe Walker, reached Mach 2.0 at 22,265 meters (73,047 ft) altitude. The plane was severely damaged upon landing. USSR launched Sputnik 3 into Earth orbit with instrument payload of over 1 metric ton, intended to be a space laboratory for study of Earth's magnetic field and radiation belt. It remained in orbit for nearly two years. USSR launched Sputnik 4 (Korabl-Sputnik 1) to place a space cabin into orbit, test life support systems, and recover the cabin from orbit. (Recovery 4 days later failed due to an equipment malfunction). The US Air Force launched KH-5 9034A from Vandenburg Air Force Base, California, the first successful KH-5 (military surveillance) mission; the film capsule was recovered 4.1 days later. With the launch of Mercury Atlas 9 (the final Mercury mission, "Faith 7"), Gordon Cooper became the fourth American to orbit Earth. 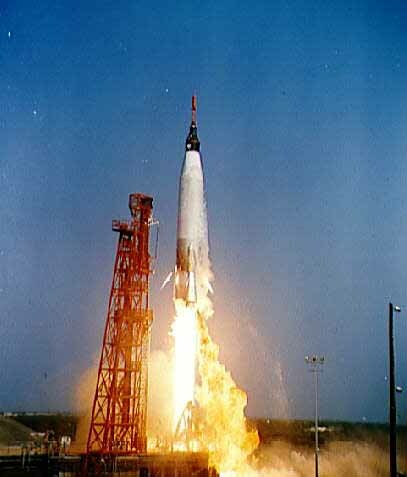 Mercury Atlas 9 (MA-9, designated also Faith 7) was the fourth and final manned orbital flight of the Mercury program, launched 15 May 1963, and piloted by L. Gordon Cooper, Jr. The objectives of MA-9 were to: (1) evaluate the effects on the astronaut of approximately one day in orbital flight; (2) verify that man can function for an extended period in space as a primary operating system of the spacecraft; and, (3) evaluate in a manned one-day mission the combined performance of the astronaut and a Mercury spacecraft specifically modified for the mission. Because MA-9 would orbit over nearly every part of the world from 32.5 degrees north to 32.5 degrees south, a total of 28 ships, 171 aircraft, and 18,000 servicemen were assigned to support the mission. Originally scheduled for launch in April, the mission was delayed twice. The first delay (February) was due to a decision to rewire the Mercury-Atlas flight control system. The second (14 May) occurred on the scheduled day of launch when a problem developed with the fuel pump in the diesel engine used to retract the gantry from the launch vehicle. This resulted in a delay of roughly 129 minutes after countdown had already reached T-60 minutes. Subsequent to the repairs on the gantry engine, however, a separate problem, the failure of a computer converter at the Bermuda tracking station, forced the cancellation of the launch at T-13 minutes. The launch was rescheduled for the following day (15 May). The countdown then proceeded without a hitch until T-11 minutes and 30 seconds when a problem developed in the guidance equipment and a brief hold was called until it was resolved. Another hold was called at the T-19 second mark to ascertain whether the systems had gone into automatic sequencing as planned. The liftoff ended up being excellent, with flight sequencing (booster engine cut-off, escape tower jettison, sustainer engine cut-off) operating perfectly and the spacecraft being inserted into orbit at a velocity described as being "almost unbelievably correct." A number of alterations were made to the MA-9 spacecraft, most of them due to the extended duration of the flight. Among these were the increased capacity of several life support system components (additional oxygen and water, increased urine and condensate capacity, etc. ), a larger capacity fuel tank, and larger capacity batteries (two 3,000 W-hour vs. two 1,500 W-hour). Deleted from the flight, due to weight considerations, were several backup or other components deemed unnecessary. These included the periscope, the backup UHF voice transmitter, the rate control system, and the backup telemetry transmitter. Also installed was a slow-scan television unit for in-flight evaluation in monitoring the astronaut and instruments. A number of improvements were also made to the pressure suit worn by Cooper. These included a mechanical seal for the helmet, new gloves with an improved inner liner and link netting between the inner and outer fabrics at the wrist, and a torso section redesigned for increased mobility. The boots were also now integrated with the suit to provide increased comfort for the longer mission, to reduce weight, and to decrease the time required to don the suit. Another change moved the life vest from the center of the chest to a pocket on the lower left leg, thus reducing the bulkiness from the suit and, again, providing more comfort during the flight. A number of in-flight experiments were planned for and carried out during the MA-9 flight. They included two visual acquisition and perception studies, several photographic studies, two radiation packages, a tethered balloon experiment, a study of the behavior of fluids in zero gravity, and a micrometeorite study. A flashing beacon, a six inch (152 mm) diameter sphere equipped with xenon strobe lights, was deployed on the third orbit and Cooper first reported that he was able to see it on the night side of the fourth orbit. on the sixth orbit, Cooper set up cameras, adjusted the spacecraft attitude and set switches to deploy a tethered balloon from the nose of the spacecraft. It was a 30 inch (762 mm) Mylar balloon painted fluorescent orange, to be inflated with nitrogen and attached to a 100 ft (30 m) nylon line from the antenna canister. A strain gauge in the antenna canister would measure differences in atmospheric drag between the 100 mile (160 km) perigee and the 160 mile (260 km) apogee of MA-9's orbit. Cooper tried several times to release the balloon, but it failed to eject from its cannister. Cooper passed Schirra's orbital record on the seventh orbit while he was engaged in radiation experiments. At T+10 hours, Zanzibar told Cooper the flight was go for (at least) 17 orbits. Cooper was orbiting the Earth every 88 minutes 45 seconds at an inclination of 32.55 degrees to the equator. When he entered night on the sixteenth orbit, Cooper pitched the spacecraft to slowly follow the plane of the ecliptic. Through the spacecraft window he viewed the zodiacal light and night airglow layer. He took pictures of these two "dim light" phenomena from Zanzibar, across the Earth's nightside, to Canton Island. The pictures were later found to have been overexposed, but they still contained valuable data. At the start of the 17th orbit while crossing Cape Canaveral, Florida, Cooper broadcast slow scan black and white television pictures to the ground. The picture showed a ghostly image of the astronaut. In the murky picture, a helmet and hoses could be seen; it was the first time an American astronaut had sent back television from space. Cooper also became the first to sleep in orbit. In addition to a planned rest period beginning the tenth orbit, he also drifted off to sleep during the second orbit for a short period. (In fact, Cooper had also reported taking a short nap during the countdown phase.) Cooper slept intermittently during the six hours of orbits 10 through 13. He woke from time to time and took more pictures, taped status reports, and repeatedky adjusted his spacesuit temperature control which kept getting too hot or too cold. The first malfunction of concern on MA-9 occurred during the nineteenth orbit when the 0.05g light came on. The light, sensitive to changes in gravity, normally lit during reentry. The pilot proceeded to check out the necessary attitude information and all telemetry indicated the spacecraft was in the correct orbit. It was therefore concluded that the light was erroneous. However, because of this, it was determined that the potential existed that not all of the automatic system for reentry would function. Cooper was advised to use the manual mode for reentry, becoming the first astronaut to use this method exclusively. On the 20th orbit, Cooper lost all attitude readings. The 21st orbit saw a short-circuit occur in the bus bar serving the 250 volt main inverter. This left the automatic stabilization and control system without electric power. Throughout the problems, Cooper remained cool, calm and collected. On the 21st orbit, John Glenn onboard the Coastal Sentry near Kyushu, Japan, helped Cooper prepare a revised checklist for retrofire. At the end of the 21st orbit, Cooper again contacted Glenn on the Coastal Sentry. He reported the spacecraft was in retro attitude and holding manually. The checklist was complete. Glenn gave a 10 second countdown to retrofire. Cooper kept the spacecraft aligned at a 34 degree pitchdown angle and manually fired the retrorockets on "Mark!" Fifteen minutes later, Faith 7 landed just 6.4 km (four miles) from the prime recovery ship, the carrier USS Kearsarge. The spacecraft tipped over in the water momentarily, then righted itself. Helicopters dropped rescue swimmers and relayed Cooper's request of an Air Force officer for permission to be hoisted aboard the Navy's carrier. Permission was granted; 40 minutes later the explosive hatch was blown open on the deck of the Kearsarge, and Cooper climbed out of Faith 7 to a warm greeting. During the flight, the spacecraft attained a maximum velocity of 28,078 km/hour (17,447 mph) and an altitude of 265 km (165 miles). The capsule reentered under the manual control of the pilot after completing 22 orbits, landing about 130 km (81 miles) southeast of Midway Island in the Pacific Ocean. The duration of the flight was 34 hours 19 minutes and 49 seconds during which Cooper travelled nearly 875,000 km (543,700 miles). Mercury spacecraft # 20 - Faith 7, used in the Mercury-Atlas 9 mission, is currently displayed at the NASA Space Center Houston, Houston, Texas. NASA launched X-15A Opt Deg/Trav Probe Test/Tech mission # 83, reached 6204 kph (3855 mph) and 37.860 km (124,212 ft). Lost both nose landing gear tires, forward fuselage buckled after APU gear box pressure loss, nose gear scoop door opened at Mach 5.2. The Central Committee of the Communist Party and Council of Soviet Ministers issued a decree to establish the Institute of Space Research in the USSR Academy of Sciences on 14 July 1965. NASA launched the Nimbus 2 weather satellite. Nimbus 2 was launched 15 May 1966 to provide TV and infrared (IR) cloud cover photos. The spacecraft carried an advanced vidicon camera system for recording and storing remote cloud cover pictures, an automatic picture transmission camera for providing real-time cloudcover pictures, and both high- and medium-resolution infrared radiometers (HRIR and MRIR) for measuring the intensity and distribution of electromagnetic radiation emitted by and reflected from the Earth and its atmosphere. The spacecraft and experiments performed normally after launch until 25 July 1966 when the spacecraft tape recorder failed. Its function was taken over by the HRIR tape recorder until 15 November 1966 when it also failed. Some real-time data were collected until 17 January 1969, when the spacecraft mission was terminated owing to deterioration of the horizon scanner used for Earth reference. USSR launched Cosmos 158 for investigation of the upper atmosphere and outer space. USSR launched the Meteor 1-25 weather satellite in a continuation of experimental work in studying the natural resources of the Earth. N. Chernykh discovered asteroid #2862 Vavilov. NASA launched NOVA I on a Scout from Vandenburg AFB, California for the US Navy, an improved Transit navigation satellite. Osservatorio San Vittore discovered asteroid #3344 Modena. The US Navy launched NOSS 8 from Vandenburg AFB, California, a cluster of one primary satellite and three smaller sub-satellites to determine the location and identity of naval units. The Soviet super booster rocket Energia made its first flight. The launch vehicle performed successfully, but the Polyus payload failed to inject itself into orbit due to a guidance system failure. NASA launched STS 48 (Atlantis 19, 84th Shuttle mission) for the sixth Shuttle-Mir docking mission. PanAmSat 10 was launched from Baikonur on a Proton booster. On a launch delayed from 4 April 2001, PAS 10 (PanAmSat 10) was an American geosynchronous communications spacecraft orbited on 15 May 2001 by a Proton booster from the Baikonur Cosmodrome. The 3.7 tonne (with fuel) satellite carried 48 transponders (24 in C-band and 24 in Ku-band) to provide direct-to-home video channels to Europe, the Middle East, and South Africa after parking over 68.5 degrees E longitude. PAS 10 replaced PAS 4. As of 5 September 2001, it was at 68.50 deg E drifting at 0.001 deg E per day. China launched a Chang Zheng 4B booster carrying the HY-1 (Haiyang-1) marine observation and FY-1D (Feng Yun 1D) weather satellites into space. The ISEE-3 Reboot Project successfully raised $125,000 to re-establish communications with NASA's ISEE3/ICE probe in an attempt to return it to a useful orbit.